10" of rain in less than 24 hours and sump pump could not keep up. Diane H. E. Gardner St.
We will properly install a hidden drainage system in your Sumner basement and completely encapsulate your crawl space with CleanSpace vapor barrier. We are here to solve the problem for you. Unlike the average Sumner contractor we use completely inorganic, waterproof materials. Even if the basement floods your walls and floors will not be damaged by the water. These waterproof products are patented and are built to create an attractive finished basement that lasts a lifetime. Foundation problems such as bowing foundation walls destroy your Sumner home’s value and can be dangerous. Our in-house team of structural and geo-technical engineers are here to help. We design and install the right solution and usually have the project finished in less than a week. You will have peace of mind as we provide a 25-year written warranty against defects on our foundation products. The sunken, cracked concrete around your Sumner home is both an eyesore and a safety hazard. It is also likely to get worse, but we can fix it for you. If you think you might have radon gas seeping into your home, it's time to take action. 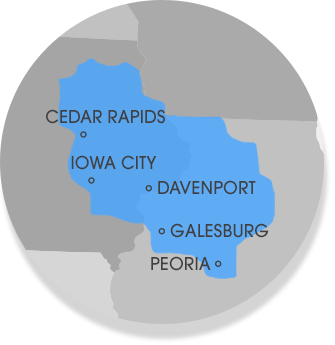 We help homeowners in Sumner, IA with radon testing, and can even provide a FREE quote for the cost of a radon mitigation system for your home. A homeowner, in Sumner, IA was having water coming into their basement. It would come in around the edges leaving the walls stained and marked. They were difficult to clean up, so they thought it was time to have an expert come in and take a look at what could be done! They called MidAmerica Basement Systems and a Design Specialist was able to come out to take a look at their home. Having their basement fully waterproofed was the best option for their home. It would meet their goals and allow them to have their space back without having any worries about water coming in! CleanSpace was one of the systems installed within their home. It is a bright, durable vapor barrier for the basement wall. It is a fast and economical installation. It stops water from permeating the basement walls and can drain wall leaks. It has a washable surface so if any marks happen to find their way onto it they can be washed right off. It also can conform to any surface type, even bumpy. The homeowners now can enjoy their home without a worry in mind that water will be coming back into it thanks to MidAmerica Basement Systems. If you are having the same issue do not hesitate to reach out. We would be happy to send a Design Specialist out to come and take a look and give you a free, no-obligation estimate! Homeowner, Dan had MidAmerica Basement Systems do previous work on his home. He had his crawlspace repaired in the past but thought it was time to waterproof his basement due to the volume of water coming in. Along with having a waterproofing system installed, IceGuard was one of the outside systems that was installed in Dan's home. IceGuard is the system that the sump pump discharges to. The pipes for the system to discharge are located outside of the home. IceGuard will allow the water to keep escaping through the pipes even when they freeze from cold temperatures. This is a great system to consider having installed because if the pipe freezes the sump pump will continue to run. The last thing you want is water in your basement! IceGuard is an automatic system that will continue to make sure the water is exiting out of the home no matter the temperature. If you are looking to have your home waterproofed like Dan, do not hesitate to reach out to MidAmerica Basement Systems. We would be happy to send a Design Specialist to come to take at your home and give you a free, no-obligation estimate!